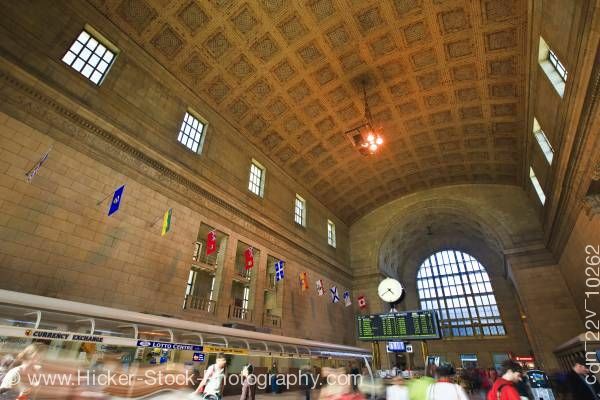 This stock photo contains the Ticket Lobby (Great Hall) in Union Station, downtown Toronto, Ontario, Canada. A crowd of people, both standing still and in motion, occupy a thin strip across the entire foreground. The remainder of this scene captures the tremendous walls, window, and ceiling of this historic railway ticket lobby, highlighting their intricate architectural details. A single large light fixture suspended high over the crowd dispenses an amber glow from the center of the vaulted ceiling, and rows of smaller windows line opposite sides of the lobby set high up on their walls.